Looking to add digital signage to your drive-thru lane or walk-up area? 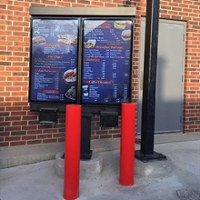 Our digital drive-thru menu board solution meets your stringent requirements for reliability: weatherproof, easy to read in all light sources, easy to maintain, and cost effective. Change your menu or message as often as you like with easy-to-use content management software. Incorporate one screen in a system to display colorful graphics of your offerings or for promotional material, or go all-digital with menu listings and colorful graphics. Be in compliance now with FDA mandated food labeling laws and include calories in the design of your menu display. Our Howard Company design department can help you lay out your menu and show you how to meet the requirements of the new food labeling legislation. Coordinate changes using software from your indoor system to update your drive-thru menu board. Our goal is to make keeping your menu systems current as easy as possible! Digital Hybrid combines a digital panel flanked by two illuminated panels. Your menu can change daily with the versatility of digital. Combine a great digital drive-thru menu board with a canopy for your perfect drive-thru lane! Devon Seafood Grill uses a single digital screen to entice guests in for dinner or drinks. Keep the drive-thru lane moving with digital preview boards.